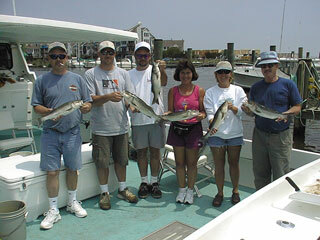 And here we have the Jen Blocksom crew of July 30 with part of their catch of limits of rockfish, some large croaker, and a good bunch of bluefish to 3 pounds. From left to right, that's Walt, Jen, Roland, Jen Blocksom, John, and Jed. 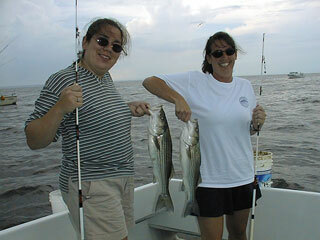 Here are the two Jens with a couple of rockfish, fresh out of the water. 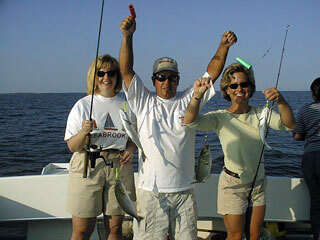 Fish this size are lots of fun on light tackle. 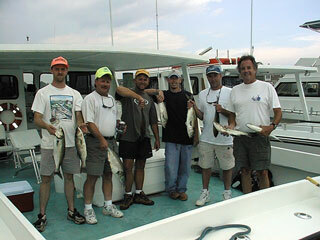 Here is the Kevin King crew of July 29 with some of their limits of rockfish, all of which were caught trolling. 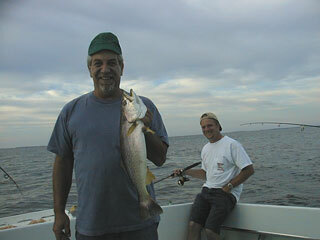 We had heard reports of some larger fish around, and here's the proof, up to 36 inches. From left to right, that's Kevin, Mike, Lee, Mike, and Jim. This is Mike with an impressive 36 inch rockfish, quite a trophy for this time of the season, and Mike's lifetime largest rock! July 26 was the date, and the weather was not much different than a monsoon. A stiff breeze made a steady rain even more uncomfortable. 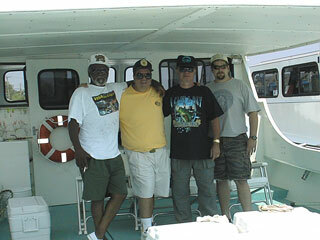 But Art McCrea and his crew were ready to fish. Besides, you can't play golf in a monsoon ... 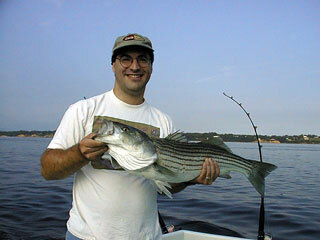 But fish don't seem to mind the rain, and as you can see the rockfish cooperated. From left to right, that's Bill, Hugo, Art, Mike, Miles, and Bob. After catching limits of rockfish and chasing some bluefish, it was off to Harrison's on Tilghman's Island for dry towels and a bushel of crabs. These guys are diehards one and all. On July 23 we served the Steve Kerns crew for a morning of rockfish chumming, casting to breaking bluefish, ending up with spot and white perch. From left to right, that's Greg, Steve, Dave, Brenda, Dawn, and Bill. Chumming at the "Gooses" continues to be good. 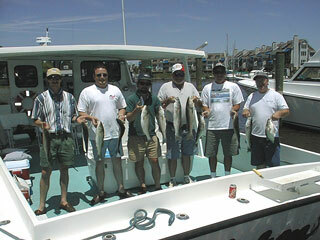 On the afternoon of July 22 the Mark Balsamo crew returned for some fast action while rockfish chumming. From left to right, that's Rick, Frank, Mark, Bob, Chuck, and Will. 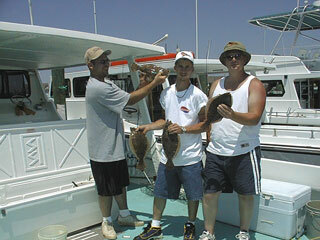 After mashing up the rockfish, we went in search of flounder. 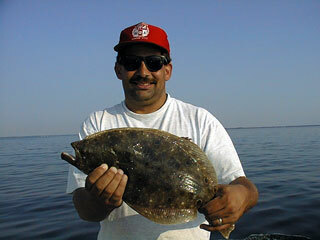 Here's Mark with a beautiful 20 inch flounder, largest of about 10 keepers. 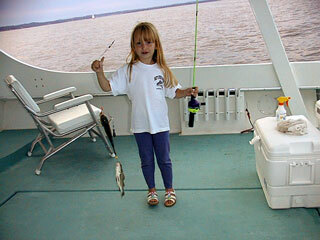 As the sun settled over the western shore, we started catching croakers. 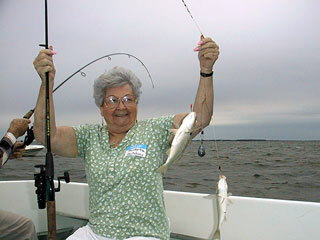 Although the croakers were not plentiful, a good time was had by all. And on the evening of July 18 we enjoyed George Bentz Jr. and Sr. along with a crew from the Pasadena Sportfishing Group for some rockfish chumming and croaker fishing. 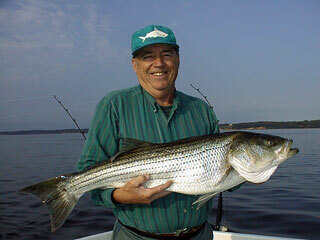 Of course George Sr. caught the largest striper. As shown, while posing for this photo with dad, George Jr. hooked up. For more PSG photos, click here. On the evening of July 16 we enjoyed the company of the Frank Kenney crew for some rockfish chumming, followed by bottom fishing for trout and croaker. 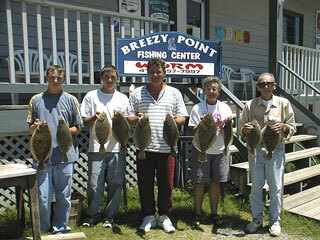 While trout were the primary target, croaker and spot wouldn't leave our baits alone. 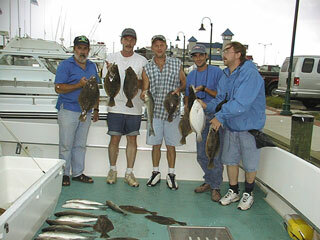 From left to right, that's Bill, Frank Kenney, Buddy, PJ, Aaron, and Frank Jr.
And here's the Mike Fox crew of July 16, shown with a nice catch of flounder to more than 20 inches, which were caught after we finished chumming up limits of rockfish. 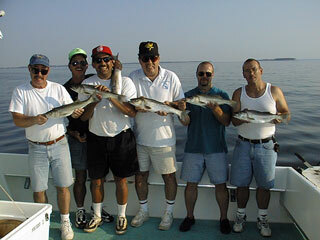 From left to right, that's Sam, Mike Fox, John, Dave, and Mike. 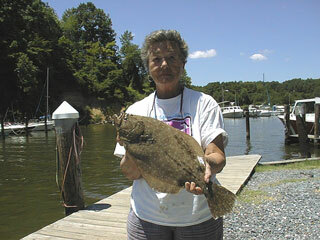 Sam took top honors with this beautiful 21 inch flattie. 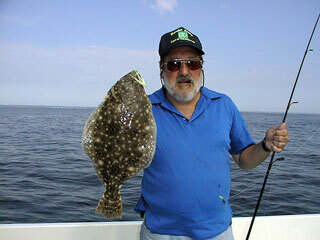 This one took a flounder teaser tipped with a strip of spot. 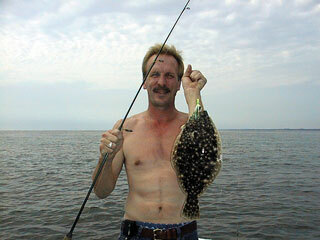 And here's the FoxMan Mike with another nice flounder. 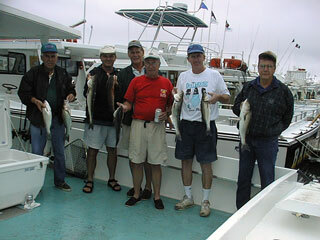 Here's the Bob Crist crew of July 15, shown with some nice blues to 3 pounds and some of their limits of rockfish. 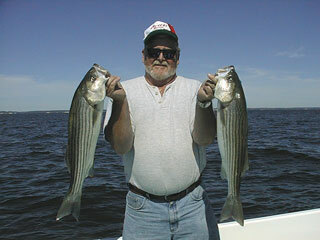 The blues were caught trolling, and the rockfish were caught while chumming near the Gooses. 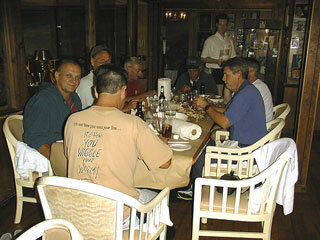 From left to right, that's John, Chuck, Jamie, Chris, Bob, and Rick. 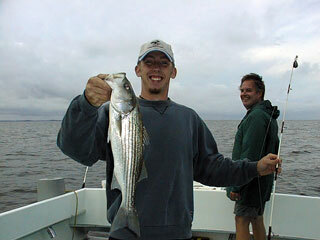 Here's Chris with his first ever striper, a nice 21 incher. 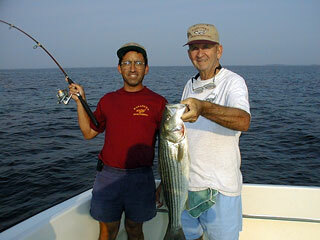 If you fish deep while chumming, you'll sometimes find other species like the big croaker shown here with Jamie. 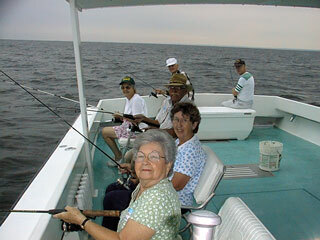 Once in a great while the Captain gets to take part of his family out on the Bay. Here's Tiffany Payne with a nice double header on spot, taken July 13 near "Old Rock". 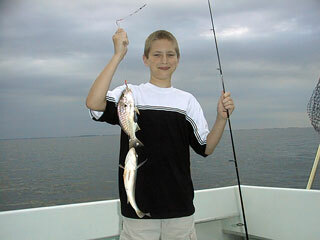 And here's nephew Justin with a pair of spot up to 10 inches. On July 11 we were fortunate to fish with almost the entire office of the Recreational Boating & Fishing Foundation (RBFF). 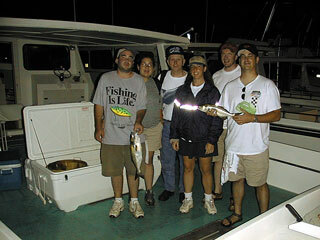 The RBFF is a nonprofit organization whose mission is "to increase participation in recreational angling and boating ...". That's Captain Drew in the middle, surrounded by young ladies named Kristen. Click here for more RBFF crew photos. Also on July 11 the Worm and crew and the other volunteers shown here participated in a "feed the needy" day. 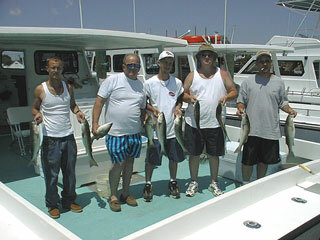 A number of other charter boats from the Rod 'N' Reel Dock also volunteered their time and services to catch a bunch of fish for those less fortunate. Here we have, from front to back, Alverta, Anne Marie, Frances, Edith, Arnie, and Ken. 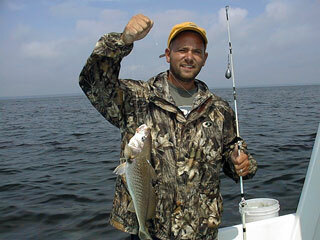 Here's Alverta with a double header on spot, some of which were up to 10 inches. On July 9 we were joined by the Morry Frankel crew from Pittsburgh. From left to right, that's Ray, Mike, Morry, and John. After catching limits of rockfish while chumming, we found breaking blues and small rock which kept everyone entertained for hours. Here's Larry of the Lance Weakley crew (shown in the background) with a beautiful yellowfin trout caught bottom fishing on July 8. 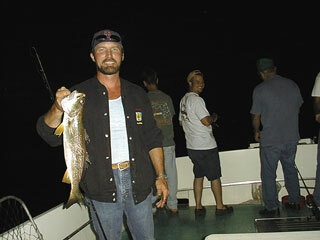 Bottom fishing continued to well after dark, when more trout were caught like the one shown here with Keith. 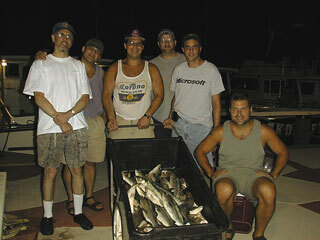 And here's the Mike Fox (not shown) crew of July 8 with their limits of rockfish caught while chumming on the Gooses. Here's a closeup of some of the fine rockfish chummed up for the Fox crew. 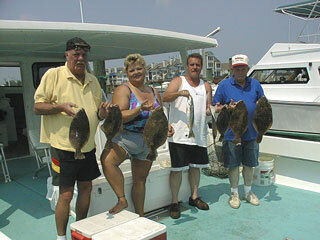 On July 7 we had the Charlie and Kitty Hurrey crew out in pursuit of flounder. From left to right, that's TJ, Tommy, Dave, Kitty and Charlie. We couldn't resist hanging up the old Worm sign. Here's Kitty with a 20 1/4 inch beauty, largest of the day. On July 6 we had the pleasure of fishing with the Ira Reiz crew for an afternoon of rockfish chumming and evening croaker fishing. 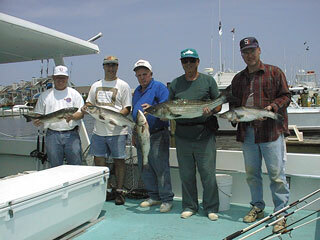 Shown with limits of rockfish and a pile of croaker, (from left to right) that's Cliff, Daniel, Ira, Eli, Seth, and Bill. And on July 1 we enjoyed having the Butch Herbert (2nd from left) crew out for a day of chumming for rockfish, followed by flounder. Although it's hard to see the whole critter, that's a cow-nosed ray (also called a skate) that probably weighed 50 pounds. 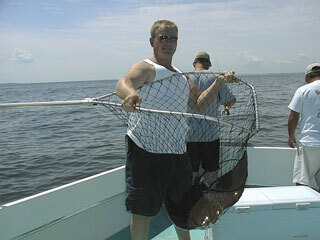 Dwight wanted a photo of it before it went back unharmed.